Public International Law offers a comprehensive understanding of international law as well as a fresh and highly accessible approach. While explaining the theory and development of international law, this work also examines how it functions in practice. Case studies and recent examples are infused in the discussion on each topic, and critical perspectives on the principles are given prominence, building an understanding of how and why the international legal system operates in the way it does and where it is heading. The book explains the theoretical foundations for each principle in detail before illustrating how these principles function in practice. 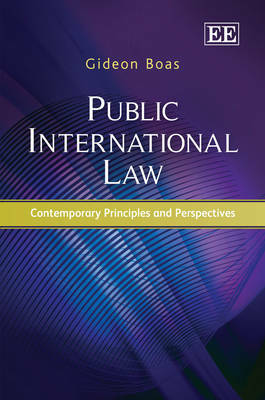 Features include: * a focus on fundamental principles of international law rather than specialist sub-topics * integrated and contextual explanation of the political and extra-legal dimensions of the international legal system * principles of international law placed within a contemporary real-life context * traditional and contemporary case studies explained in the context of legal principles * uniform structure to facilitate understanding. With insight founded on the author's many years of experience as a practitioner and academic in the field of international law, this work will offer legal practitioners, policymakers and students, both undergraduate and postgraduate, an invaluable insight into the field of international law.